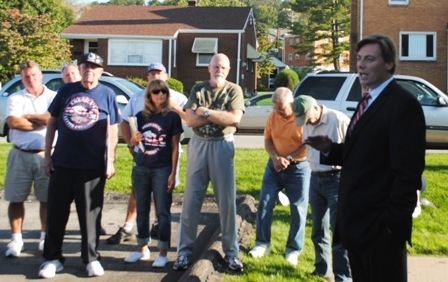 Fifty postal workers and their allies rallied outside the Aliquippa office of Congressman Jason Altmire on the afternoon of Sept 27. They joined postal workers around the country demanding changes in special accounting rules imposed on them by Congress. The cost of the rules threatens to end Saturday deliveries, lay off 120,00 workers and close many post office facilities across the country. “Congress created this problem and Congress can fix it,’ states a USPS TV ad explained the problem. Unlike any other agency, the are required to overpay billions of dollars into their pension fund by the same amount that it would take to clear up the Post Office’s current deficit. Altmire spoke briefly to the gathering, saying that he agreed with them, and would back legislation to support them. He warned, however, that the fight would be hard. “What’s with Issa? Why is he doing this?” shouted one of the workers in a question to Altmire. He was referring to California GOP Rep. Darrell Issa, the House leader of the drive against the Post Office. The workers were glad to get Altmire’s support on the issue, but many were still wary due to his recent ‘Blue Dog’ votes with the GOP on other budget matters.